With all the baking and sugar-inhaling that I do week-daily, you might think I couldn't stand the thought of eating any more sweet stuff on the weekend. When baking becomes your job, maybe it gets redundant and mandatory and sugar becomes the enemy? No. Negative. That never happened. It's like that time my parents introduced my 9-year-old self to the all-you-can-eat ice cream sundae buffet at The Olive Garden. I swore I would "never eat ice cream again". That lasted one day. I do, however, enjoy treats that are not soooooo sweet once in a while. I still get cravings on Saturday nights and I still love to bake in my free time, but I don't mind something a little softer and subtle. These brownies are almost the total opposite of what I preach about. They don't have that shiny wrinkly top and they are not super dense and rich like fudge (though I love that like mad!). These have a lighter texture but are still sticky and moist. They go down easier since they're more restrained when it comes to sugar and butter. 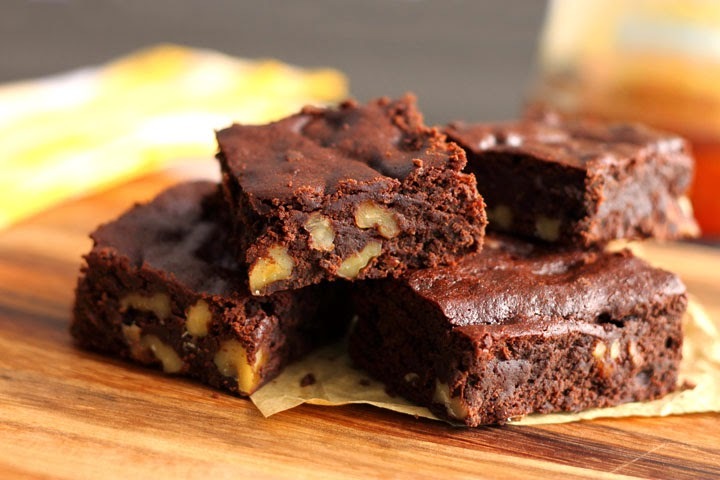 How do you keep brownies moist while using a fraction of the sugar? Use liquid sugar. And only 1/4 cup of it is needed here. Liquid sugars have special properties of retaining moisture when added to baked goods. That includes honey, molasses, maple syrup or agave nectar. In this case we need honey because of its thickness. Maple syrup would be too diluted and runny. The acidic floral notes of honey also pair gorgeously with the bitter and slightly acidic notes of a good dark chocolate. I just love this combo! These are also flourless, which makes them gluten-free on purpose. 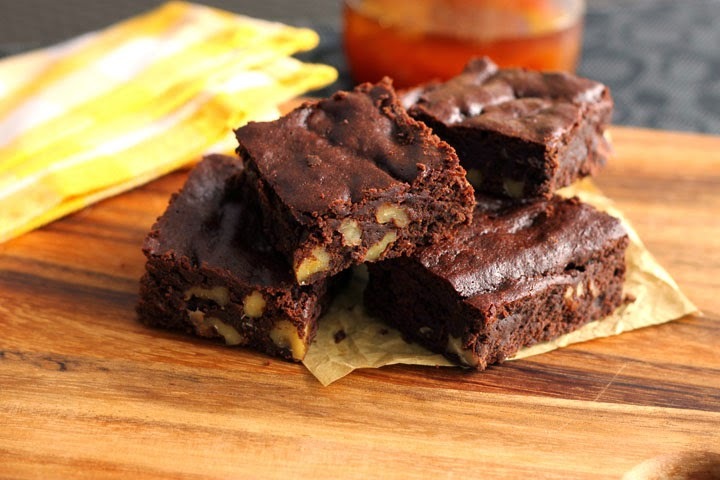 A blend of corn starch and cocoa powder keeps the texture soft and moist. A bit of baking powder is completely unorthodox here. 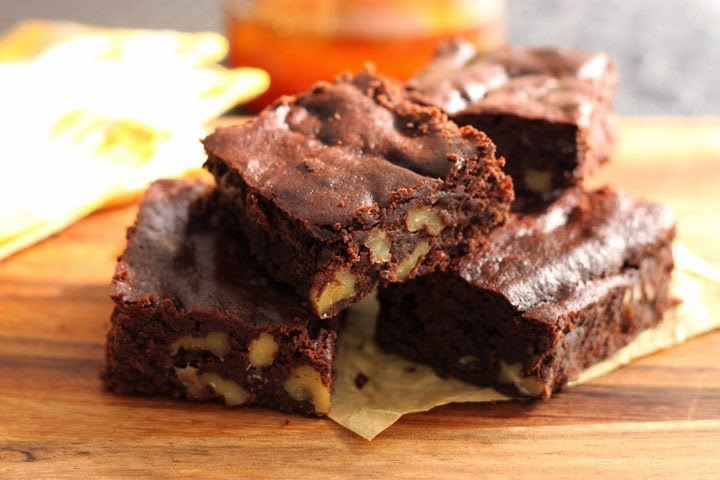 As much as it does not belong in a traditional brownie, this is not a traditional brownie. We need a bit of puff to build some structure in the absence of sugar. The only thing that these guys have in common with my classic brownies are 200 grams of delicious dark chocolate. That ain't going anywhere! I hope you dig it. Dig in. DE-lish. In a small bowl, sift together corn starch, cocoa powder, salt and baking powder. Melt together chocolate and butter in a medium saucepan over very low heat with frequent stirring. Remove from heat and stir in the vanilla and eggs until well combined. Stir in honey. Add the dry ingredients and stir in until well combined. Stir through chopped walnuts. Spread batter evenly into prepared pan and bake until a skewer inserted in the middle comes out clean, about 20-25 minutes. Let cool completely in the pan before slicing.